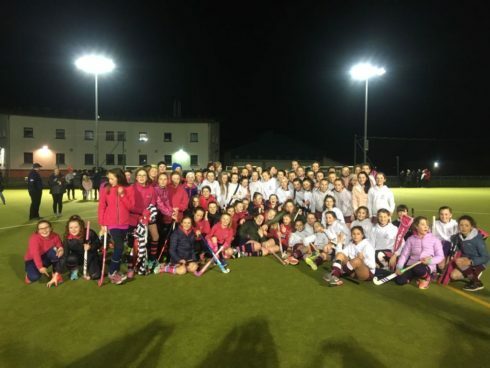 On Wednesday 9th March everyone was buzzing as we knew that day was the hockey trip to Limerick! We put our bags at the bottom of the bus, took our seats, the parents took the roll call and then we set off. On the bus we sang songs, played quiz’s and did a lot of talking! We stopped off at the Obama Plaza for something to eat and we had great fun and laughs there. After that, we went straight to the hockey blitz to play against Villiers Hockey Club who had very competitive players. We were put into our teams and the parents were very good managers. The matches were enjoyable and when they were over, Villiers very kindly offered us hot chocolate and sweets which was delicious! When we finished the blitz we went to Supermacs and we laughed our way through dinner. Then we went to the Greenhills Hotel where we were staying. We were all very impressed with it and the staff were very friendly. We stayed in the rooms with our friends in groups of twos and threes. When we saw our rooms we thought they were very snazzy. Then we got dressed into our pyjamas and went down to a big room called the “green room” and Marcus (Karla’s Dad) prepared a great quiz with lots of categories for us to play. When that finished we went back to our rooms and stayed up all night! The next morning at 7:30 am we got out of our beds and went to the swimming pool at 8:00am. It was very enjoyable and the parents had little competitions for us to play in the pool which ended in complete laughter! At 8:45am we went back to our rooms, got dressed and went down to a beautiful breakfast buffet for us to help ourselves with and it was very tasty. Then we packed our bags and went bowling. We were put in teams again and the player with the most points from each team won an easter egg and a very cute teddy (I lost by 6 points!). We got back on the bus and headed back to Obama Plaza for lunch. When we finished there we got onto the bus and headed home. I would like to thank all the parents and our super coach Bronnie who made this trip happen. They made it the best fun and everyone really appreciates their time and effort to make the trip the best time ever! By 6th class player Jane O’Sullivan.